Once the Republican primary field was decided to be three candidates, it became apparent that Donald Trump was the only one who could get the 1,237 delegates needed for the nomination. So why would other candidates stay in? Essentially, because Donald Trump is an outsider candidate, those within the party were looking to try and stop him from getting to that delegate count. If he comes up short, then a contested convention can happen and the nominee can be changed. So the goal for Cruz and Kasich was not to win the nomination, but rather to ensure Trump had a harder time getting there. 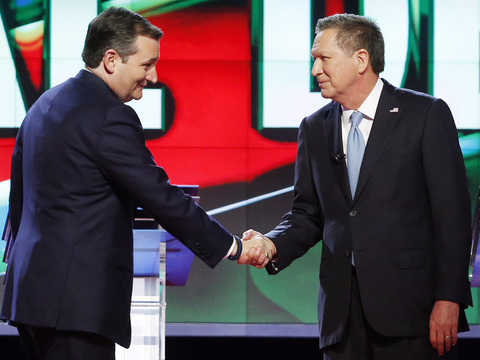 In an effort to reach that goal, both candidates made a pact: Kasich would not campaign in Indiana, while Cruz would not campaign in Oregon and New Mexico. In theory, this would whittle the field down to two in each state making it more plausible to defeat Trump. At least on Cruz’s side, the plan did not work. He lost Indiana to Trump and ended his Presidential campaign the same day.